Q: Can I get my order rushed to me? Q: How do I get a Private Gallery of archived images? A: Call or email us with the information from the event you want us to post for you. The price for the Gallery is $25. If you order your Private Gallery within 3 months of the event expiring from our site, you will receive a $10 credit toward your order. If you order your Private Gallery 6 months or more past the expiration of the event gallery, there will be a $15 archive retrieval fee added for each event requested. When you click the link for the right gallery, it will open in a new page. Create a new account with your email and a password (your "Favorites" will be saved in your personal account). You may share this gallery link with your friends, it is not password protected, but they will also need to create an account. NEW: You can now add images from any gallery (Portrait or Action) to the same cart. You can also make a collages with portrait and action images in it but please keep in mind, these collages are not eligible for a discount. Please pay attention to item descriptions. Images are previews only - orders will be cropped (if requested) and all images will be color-corrected if needed. To request a crop, click "my cart". Each image will have a quill next to it. Click the quill and add your comment but be SURE you click "Update Note" when you are done or it will not save. When you complete your order, your credit card is NOT automatically billed - we do that once we double-check your order form and are ready to work on your order. You will get a copy of your credit card receipt with your order. REVIEW THE VIDEO TO THE RIGHT! 2016 DACOF Border - will be on all action images unless requested otherwise. 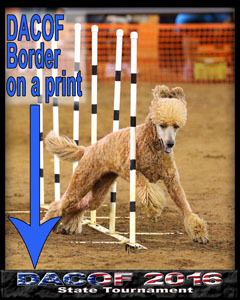 The Commemorative Border, if applicable, will be at the bottom of ALL action images (print and electronic) unless requested otherwise. It WILL NOT cover anything on the print (see image), nor will it be on awards or portraits unless you request it in "Comments" at check out.